Explore all of the map and find all of the respawn points in Canada. Find and investigate the historical objects in each neighborhood of Canada. You've taken 500,000,000 damage and are an adamant example of heroism. Find all neighborhoods and respawn points in the desert. Research the history of notable Desert sites. Enter all neighborhoods and find all respawn points in Lemuria. Research the history of notable Lemurian sites. Complete all of the Aegir Diver Perks as well as all Lemuria exploration perks. You've thwarted the Destroid uprising in Millennium City! Clear all of the map and find all respawn points on Monster Island. Find and investigate the historical objects in each neighborhood of Monster Island. You have defeated Ascii Oakley! You have defeated Black Talon! You have defeated Bleak Elder! You have defeated Captain Claw! You have defeated Clyde Von Schoultz! You have defeated Dr. Dino Demogaard! You have defeated Dr. Destroyer! You have defeated Dr. Moreau! You have defeated Escaped Qularr Swarmlord! You have defeated the Giant Destroid! You have defeated Hanging Judge Hensley! You have defeated Hyena Swine! You have defeated Hyrg Coruscator! You have defeated Khusor the Crooked! You have defeated Lionel Benjamin! You have defeated Major Gertz! You have defeated Mind-controlled Brute! You have defeated Mind Slayer! You have defeated Nest Leader Tadataka! You have defeated Paul Johnston! You have defeated Rampaging Teleioraptor! You have defeated Steel Commando! You have defeated Teleiosaurus Hatchling! You have defeated The Bronze King! You have defeated Dr. Timothy Blank! You have defeated Ultimate Mind! You have defeated Vikorin the Blind! You have defeated Viper X! You have defeated White Rhino! Even the possibility of Dr. Destroyer's return has set the entire world on Edge. What is the truth behind these rumors? Has the greatest villain in the history fo the world really come back after his almost-certain death in the Battle of Detroit? The truth must be found! All over the world strange clues and cryptic accounts hint that something dark and monstrous has begun to stir beneath our reality, spreading unnatural tendrils of corruption. What are these strange beings, and can they be stopped? The evil organization known as VIPER has dedicated vast resources into creating a new breed of super-soldiers. If they succeed, it will set them up for a new era of crime and conquest. As rumors of Dr. Destroyer's return spread panick throughout Millennium City, his Destroids have begun attacking the City's Downtown District. Someone must stop them! War never changes, but it can change the soldiers who fight it. Help the troops of Project Greenskin against the irradiates, and against a foe far more terrible. The sudden Qularr attack has left the people of Millennium City in all manner of trouble. A Super-Hero's work is never done. Cheif Surhoff could use help dealing with a Prison Break in Westside in Millennium City. This statue commemorates the lives that were tragically cut short during a rampage by the supervillain Grond. After the army base that originally stood here was reduced to rubble by the raging behemoth, PRIMUS rebuilt the base and renamed it âProject Greenskin.â We have dedicated our efforts to stopping Grond, and all the other unfortunate souls who have been transformed by radiation into creatures of mindless, mutant rage. Put an end to VIPER's experiemnts with Teleiosaur eggs in Slither Beach on Monster Island. Bow and pay tribute, unworthy one, to the genetic perfection that is Teleios. This statue has been erected by the Perfect Oneâs loyal minions, grateful for his genetic mastery and boundless genius. 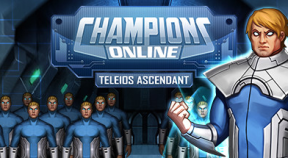 A being of towering intellect, and unparallel scientific accomplishment, Teleios has claimed this neighborhood as his own, and warns all who dare oppose him to leave forthwith, else end up as subject of Teleiosâ next great experiment, and his latest inevitable biotechnology triumph! Wayfayer Coast is the site of the original Qularr invasion in the early 1960s, and an area that these peculiar insectoid extraterrestrials have recently returned to and repopulated. Intelligence gathered by Bureau 17 and UNTIL suggests the Qularr are prepping for another full-scale invasion attempt. They are interstellar geneticists, and their strange science, incomprehensible to Earthlings, is responsible for creating many of the enormous monsters that now roam throughout Monster Island. The Qularrâs most recent creation, Qwyjibo, may be the most terrifying and deadly of their monstrous menagerie. The heart of the Millennium City, Downtown is the home of the breathtaking architectural wonders known as the Renaissance Center. The âRen Cenâ skyscrapers may be the primary reason Millennium City got its nickname, âThe City of the Future,â but in Downtown there are several poignant reminders of the past. Millennium City was built upon the ashes of Detroit, a city reduced to ruin after a savage attack by Dr. Destroyer. Both Memorial Park and the Battle for Detroit Museum pay remembrance to the citizens and superheroes who died during the terrible assault. The Hall of Heroes, meanwhile, honors the heroes of the present, who risk their lives on a daily basis to ensure Millennium City is safe and secure. The municipal hub of Millennium City, City Center houses the non-profit self-help organization Mind Inc., and headquarters for companies as varied the Adair Media, Dynamic Technologies Research Group, and the multinational conglomerate ARGENT. This neighborhood is also the civic center of the Millennium City, where Mayor Calvin Biselle can be found conducting important city business within the Mayorâs Office in City Hall. If you are reading this, turn back! These lands are corrupted, and an evil is buried here that must not be unearthed! A century ago, the miners of the Lost Lemon Mine paid a terrible price for trespassing on these lands, and soon those fools from ARGENT will meet the same tragic end. You are warned! Turn back, or face an evil beyond all human comprehension. A horde of Irradiated mutants is attacking the Primus Base known as Project: Greenskin. What could be driving them to this rampage? Let these ruins serve as a warning to all who would defy the Bleak Ones! Within these dark depths are the crumbling remnants of Old Lemuria, a once-majestic empire which sank to the bottom of the sea after its blasphemous Priest-King, Faltrah Lem, led the people of Lemuria to ruin. Lem ensured the doom of Lemuria by convincing his subjects to embrace new deities and reject the dark gods known as the Bleak Ones. Shortly after, Lemuria fired its Mandragalore doomsday device for the first --and only-- time. The Bleak Ones bid the weapon backfire, and the Old Lemuria paid the ultimate price. It has sat in silence for tens of thousands of years since, a reminder to all of the terrible power of the True Gods of the Deep. Headquarters of the power-armored peacekeepers known as the RCMP Steelhead Division, a Canadian government agency that tracks and investigates supervillains, coordinates with local heroes, and has agents keeping tabs on recurring trouble spots. This plaque commemorates two hundred years of exemplary service by our great Lemurian leader, Arvad. Ruling this underwater paradise with a stern hand, Arvad keeps the peace by quashing all dissonance among his subjects, especially the periodic reemergence of radical Lemurians loyal to the old gods known as the Bleak Ones. These Lemurian rebels represent the greatest danger to our great leaderâs sovereignty and the Lemurian way of life. These rebels have declared the Bleak Ones want Lemurians to transform into a more primal aquatic form, and erase the blight that is humanity from both land and sea. As Arvad commands, all good Lemurians must stand vigilant against these threats. Investigate ARGENT activity in the Hoarfrost Hills and find out what they're really up to. Deal 5,000 damage. Your unwavering efforts to beat back the forces of injustice have unlocked the Avenger Role! Ostensibly a booked-all-season Paintball Camp for extreme sportsmen, this camp is actually a cover for the Canadian terrorist splinter-group, the Hunter-Patriots. Their headquarters are here, and this is where they plot the overthrow of the Canadian government. While PRIMUSâ Project Greenskin is working to understand and ultimately contain the threat of the mutated monster known as Grond, VIPER is trying manufacture more of these genetic monstrosities. Project Stein, led by one of VIPERâs lead scientists, Dr. Timothy Blank, is devoted to making a radioactive serum that will create super-strong but slightly more intelligent Grond-like creations, ones that will be loyal to VIPER. Once Blankâs serum is perfected, it will be loaded into missiles and launched across the world, where explosive fallout will send a radioactive bacterial agent into the atmosphere-- and create an VIPER-controlled army of Gronds! These are the waters of the Rastrinfhar. The soul eaters. The face of oblivion, whose seat of power rests in the darkest and most desolate corner of the ocean. This is the home of the Bleak Ones, who bid you submit to their rule, or face a fate more horrible than a hundred deaths. We are the Old Ones, the Lords of the Deep. Ours is a power older than the lands, and deeper than the sea. You will obey us. You will not be warned again. Stp VIPER's research into psychic and super-human phenomina at "The Clutch"
Not a wildlife preserve at all, but in fact an ARGENT owned-and-operated corporate hunting ground, where stockholders, executives and other business bigwigs are flown in from all over the world. These ARGENT VIPs are wine-and-dined, and sent on safaris to hunt all manner of exotic animals, including intelligent Manimals kidnapped and kept here solely for the huntersâ barbaric pleasure. Recently, animal rights whistleblowers such as famed zoologist Dr. Janice Sellers have come to Monster Island, and are dedicating themselves to putting a stop to ARGENTâs rampant cruelty. This area houses several labs known as "The Clutch," where VIPER scientists perform experiments as part of their Project Awakening, a program devoted to unleashing the human brainâs psionic potential. VIPER hopes the program, once complete, will lead to the creation of an army of psychic super-soldiers. Help long-dead lawman Samuel Whete to undo the Hunter-Patriot's curse. The Hunter-Patriot revolutionary group is trying to take advantage of the chaos in the wake of the storm and the crash, and has brought in a team of hired Super-Villains known as the Brain Trust to help them. Travelers beware! These lands were once recognized as a place of power, blessed by the Northern Gods. For several centuries, it served as a burial ground for various native tribes, who traveled from near and far to bury their tribesmen here. In recent years, because of the corrupting influence of Kigatilik, the inherent mystical power of this land has turned malignant. Today, the immortality-obsessed necromancer Necrull has come to this ancient native burial ground and is raising the dead, using their energy to increase his own dark power, and perfect his formula for a "Necrullitic Elixir." The highest security prison in the entire world, the supervillain penitentiary Stronghold houses some of the most dangerous and diabolical superpowered threats on the face of the planet. This maximum security facility was built to withstand anything short of a nuclear bomb, and utilizes literally thousands of different safeguards, including a state-of-the-art âhot sleepâ facility which puts certain uncontrollable criminals into an induced coma for the duration of their sentence. If there is such thing as an âescape-proofâ prison, Stronghold Supervillain Penitentiary is the place! A thriving frontier boom town during the gold rush of the mid-nineteenth century, Burnside dried up a few months after the depletion of its largest, and last, gold vein. A ghost town ever since, Burnside has experienced an reawaking of late, as dark mysticism has compelled the long dead townspeople to rise from their graves as spirits with an insatiable hunger for the souls of the living. You've stopped a moment to smell the...say, what kind of plant is this anyway? Low level radiation permeates this area, though Burning Sands is not nearly as deadly as the Atomic Wasteland to the north, where most of the governmentâs nuclear tests were performed in the 1950s. Nonetheless, prolonged exposure to the radiation in this area is not recommended, as PRIMUS has already seen deleterious effects and diminished mental capacity in some of their soldiers stationed to Burning Sands. If you experience nausea or vertigo, it is recommended you leave Burning Sands immediately. There's something strange happening in Millennium City's City Center district, and Silver Avenger Mayte Sanchez will need your help to uncover it. Investigate the strange goings-on around the self-help company Mind Inc.
Over the years, there have been numerous Bigfoot sightings in the remote hills of Chiyetanka Bluff, but little in the way of concrete evidence that the elusive creatures are anything more than an urban legend. Some witnesses claim the Bigfoots are docile and friendly. Others report them to be savage and bloodthirsty. No photographic evidence exists beyond a handful of dark or blurry photos, most of which are thought to be hoaxes perpetuated by pathetic pranksters desperate for attention. Uncover the presence of Pheonis, one of the diabolical Crowns of Krim, and put an end to his evil plans in his hidden lair on Monster Island. Foxbat's causing all kinds of trouble in the Westside district of Millennium city. Whoever controls the seas around Lemuria will be able to influence the outcome of the revolution. Help UNTIL gain control of the waters around the Undying Reef. Howdy pardner, and welcome to the Snake Gulch, and rootinest, tootinest, rowdiest robot cowboy amusement park on this side of the Pecos! Built by genius toymaker and robotician Tyrell Donaldson, Snake Gulch provides a heapinâ dose of fun and adventure for the entire family. Snake Gulch attracts tourists from around the globe, who come to see the Old West recreated in a contained environment thatâs both safe and educational. Take off yer spurs, grab a sarsaparilla, and stay for a while. At Snake Gulch, we guarantee a good timeâor your money back! Manimals of Mal Zver village are strong. Manimals of New Gornyj are weak. Manimals of New Gornyj do not obey Moreau. Manimals of New Gornyj do not obey Hyena-Swine. Manimals of New Gornyj do not believe in Law of the Jungle. Manimals of New Gornyj believe in Lawgiver. Lawgiver is weak. Lawgiver say Manimals and humans live in peace. Lawgiver say no spill blood. Lawgiver say Manimals walk on two legs, not four. Manimals of New Gornyj reject Moreau and Hyena-Swine. Manimals of New Gornyj follow Father Elk. Manimals of Mal Zver are enemies of human-loving Manimal weaklings of New Gornyj. You've discovered a little nook! The site of numerous UFO sightings, Fallen Sun Forest is the subject of numerous books by conspiracy theorists convinced it is a staging area for a group of reptilian extraterrestrials known as the Gadroon. One popular conspiracy theory says that the Gadroon are conducting terraforming experiments in this neighborhood, part of a larger plan to alter the Earthâs environment and make it more habitable for their species, in anticipation of an upcoming Gadroon invasion and occupation of the Earth. A tragedy is about to play out as two young lovers are caught up in the gang violence of the Westside District of Millennium city. That is, unles you can help them. Named after one of the few venomous snakes indigenous to Canada, Massasauga Hills is home to VIPER's Project Awakening, where VIPER is training âmentalistâ soldiers that have undergone experiments to unlock their latent psychic and psionic potential. VIPERâs brigade of mentalists include precognitives able to see the future, but their designs are still a long way from being perfected. FInd out who or what is causing the riot in Stronghold Prison and put a stop to it. After outlaw geneticist Phillippe Moreau was run out of his Beast Mountain community in the Ukraine, he moved to Monster Island and resumed his experiments in Wellâs Pass. More callous and depraved than ever, Moreau continues to intermingle the DNA of human and animals, and the horrendous Manimals that live in this neighborhood are the putrid fruits of his labor. While Moreau is secure in an underground laboratory, he is served by an army of ruthless and savagely loyal Manimals. Trespassers are warned to beware. Strangers caught on Moreauâs land are likely to end up under his scalpel, to become Moreauâs latest genetic abomination. Link up with Millennium City's protecters and stop the Qularr attack at it's source. Westside's New Purple Gang is about to make a move, and it's up to you to stop them. ARGENT Agents have been kidnapping Manimals in the Feral Tangle and taking them to their "Corporate Wildlife Preserve" elsewhere on Monster Island. They have to be stopped! Brianna Biselle has gone missing in the City Center District of Millennium City. What sinister force could be behind the girl's Dissappearance? Mad Geneticist Dr. Phillippe Moreau is trying to build an army of Manimals in Well's Pass on Monster Island. Cripple the growing force before it becomes a threat. Stan Sizzou needs help to complete his deceased friend's last project. And getting some revenge on the sharks that killed him wouldn't hurt, either. The site of extensive nuclear testing by the government in the 1950s, this area is unfit for any sort of habitation due to deadly amounts of radiation. Side effects of this radiation include mutation, diminished capacity and heightened aggression. Project Greenskin scientists are pursuing multiple avenues to clean up the waste and toxicity of the Atomic Wasteland. They hypothesize that humans may be able to return here and experience no noticeable adverse effects from the radiation in as little as a million years! Receive 5,000 damage. Your unyielding stand against the forces of corruption and injustice has unlocked the Sentinel Role! Deal the numerous robot-related issues of Wayfarer Coast on Monster Island. The Servants of the Bleak Ones seek to free their long-imprisoned masters. Now may be the only chance to stop these Eldritch Horrors from entering our world. The endless tide of Dr. Destroyer's Destroid robots has to be coming from somewhere. And if their source isn't found, it could be the end of the Downtown district of Millennium City! Currently undergoing a vigorous reconstruction and refurbishment effort, Westside is Millennium Cityâs unpolished diamond. Thanks to new city jail, and a concerted effort from local law enforcement and dedicated superheroes, criminal and gang activity is starting to get under control, and soon Westside will be free to thrive as the industrial hub of Millennium City. This neighborhood is also home to the cityâs exotic Chinatown district, which offers Millennium City charm with a distinctive Far Eastern spin. The peaceful Manimal village of New Gornyj in the Feral tangle is under seige from the savage Manimals of Mal Zver, and needs your help to survive. Heal 5,000 damage. Your selfless care for your teammates has unlocked the Protector Role! Weaken Dr. Phillipe Moreau's defenses in Well's pass, halt his cruel experiments, subvert his ties to VIPER, and end his Manimal-making menace. Let the burning bones of our enemies serve as a warning to all those who would take up arms against Lemuria. Thousands of years ago, this land was home to the majestic palace of Andrith the Golden, the great and wise Priest-King of Lemuria. The royal House of Hyrg hereby reclaims Andrithal in the name of great Lemuria. It is our destiny to rule the lands and seas of this planet, and our new allegiance with the Bleak Ones will ensure that Lemuria returns to the glorious empire it was always meant to be. A strange storm has brought down an airliner, and unnatural creatures are hindeirng the rescue effort. Put an end to Necrull's corruption of Burual Butte and the dead laid to rest there. Friends of Mother Earth unite! Stop the exploitation and despoliation of these lands by the corporate oppressors known as ARGENT! The ravaging of this once-pristine land by greedy business interests must come to an end! The endangered Speckled Silver-Beak Snow Thrush must be protected, and its fragile habitat preserved! Join us to protest the numerous ecological offenses of ARGENT, and do your part to protect the planet! An area of vast mystical power, containing a nexus point between the four great spirits of the land. The powerful Demon of the Lost, Tilingkoot, is said to be roaming here, using this nexus point to summon other demonic servants. It is rumored that Tilingkoot is attempting to raise an army from the netherworld, and amass enough power to summon forth the evil Inuit God Kigatilik. Project: Greenskin's studies of the Uranium Flats area were severly hampered by the Irradiate attack. The scientists will need your help. Lemuria is caught up in a bloody revolution as the zealous rebels try to kill or convert the remaining loyalists. Can even your power protect the Lemurians in their time of need? The largest and most ambitious of VIPERâs many worldwide operations, VIPERâs primary mandate on Monster Island is to spy on their many rivals and enemies on the island, and obtain as much technology and potential weaponry as possible. The Island Nest VIPER laboratory benefits from advances and discoveries of VIPERâs other projects and programs, including Project Stein in the Southwestern Desert and Project Awakening in Northwestern Canada. These discoveries are being incorporated into a program in Monster Island to enhance VIPER soldiers through the use of Omicron Technology. Disrupt the Lemurian House of Hyrg's expedition to excavate the ruins of Andrithal on Monster Island. This document is classified and intended for VIPER agents with only âVenomâ level security clearance or higher. Information within document pertains to history of location code named âArea 51.â Formerly a secret U.S. military base, Area 51 was decommissioned during a round of budget cuts in the 1990s. VIPER has since covertly assumed control of base and is using it as base of operation to investigate nearby crash of interstellar extraterrestrial vehicle belonging to Qularr. This document will now self destruct. Recover the fragments of the long-lost Scroll of Andrith, then create the ancient recipe to return Lemurians to their humanoid forms. Buried on the shores of Great Bear Lake are the remains of âBig Mooseâ Mosiondz, the famed pioneer, tracker, trapper, and muleskinner. Known as one of the toughest frontiersman in all of the Canadian Wilderness, Mosiondz traveled 180 miles by foot during the Blizzard of â23, after losing 8 toes and 6 fingers to frostbite. He was mauled to death the subsequent summer by a black bear while leading a hunting expedition. In the late 1980s the Japanese agency for paranormal and supernatural affair, Bureau 17, established an observation outpost here. Named âEchinocos Shoresâ because of the discovery of some highly unusual species of indigenous worms, the neighborhood recently became the home of a different sort of worm, the Elder Worms, an ancient, evil race of annelidoids devoted to the annihilation of mankind. Bureau 17 scientists believe the Elder Worms are searching for a lost Elder Worm artifact thatâs been lost and buried for untold millennia, from back when the planet was still young and primal and the Elder Worms ruled the Earth. Take a closer look at two sailboats. The Crowns of Krim, six vile and debased individuals empowered by mystic artifacts, are on the move. Defeat the first of them, and hope that it's enough to stop their horrifying plans. Investigate the steam where the lava pours into the ocean. Explore Island in Well's Pass. Find the secret cave in Well's Pass. Disable the Primary, Secondary, and Backup Communications Arrays near Project Awakening. Live the sweet life. Cavort in the fountain in Downtown. Walk the entire length of the pipeline near the refinery in Snow Thrush Sanctuary. Destroy the three skulls atop the burial cairns in southern Burial Butte. Travel from the entrance to Eclipse's Cave to Tilingkoot's Altar. What sinister connection binds together Millennium City's Purple Gang, the self-help group Mind Inc., and the sinister organization of evil mentalists known as PSI? Destroy all 8 targets at the Renegade Run rifle range. Search the dud bomb in the northeast Atomic Wasteland. You have found a haunted campsite! Take a closer look at the inside of a dumpster. You have defeated an entire shipment of MechEnforcers! Experience the volcanic nature of Monster Island. Kill the Gadroon villains in the tower near Fallen Sun Forest. View Millenium City from the top of its highest structures. You have brought the infamous inmates Buzzard, Rot, Darkmoon, Windfist and Neanderthal back to justice! The hidden undersea city of Lemuria is being torn apart by a brutal civil war. The humanoid Lemurians loyal to King Avad are struggling for survival against the reptillian and amphibian Lemurian rebels. Recover the black box from the Oceanica 408 wreckage. You've Journeyed to the Center of the Earth! This was the first ship brought down in the Qularr invasion, with luck it won't be the last. You've climbed atop one of the gates to Westside's Chinatown. From up there, the view of the fireworks is particularly nice. The Multinational Corporation ARGENT is suspected of numerous abuses of practices and shady dealings. Uncover the truth, and bring them to justice. The Qularr and Gadroon, two different hostile alien civilizations, have returned to Earth at the same time. Why have they returned, and is there a connection? Find all ten Grond-hunter pits. To the mad geneticist Teleios, no crime is too great great to stop his quest to achieve perfection, and no sacrifice too horrific. Win the Apocalypse Stronghold on both the Hero and Villain sides. Take 1,000,000 Fire damage in the Lava Temple. Make use of the Volatile Container in the High-Tech Arena. Pick up and throw 25 objects on the Westside B.A.S.H. map. You've Saved the Divers and Defeated the Robotic Pirates! You've Taken Out the Generators! You've Defeated Rictus and his Zombie Horde! You've stopped the crisis on Monster Island! You've defeated Ascii Oakley and her posse of Robot Cowboys! You've Defeated the Flying Dutchman and her crew! You have defeated Hi Pan! You've defended the Alien Technology from VIPER! You've stopped the crisis in Lemuria! You've Defeated the Xenoforming Gadroon! Complete all of the listed Perks during the Attack of the Misfit Toys Winter Event. Put together all Five Winter Action Figures during the Attack of the Misfit Toys event. You have defeated Shadow Destroyer in the Qliphothic Realm! You have defeated Shadow Destroyer!